a thin layer of tissue that covers a surface, lines a cavity, or divides a space or organ. adj., adj mem´branous. 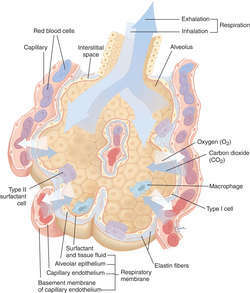 alveolar-capillary membrane (alveolocapillary membrane) a thin tissue barrier through which gases are exchanged between the alveolar air and the blood in the pulmonary capillaries. Called also blood-air barrier and blood-gas barrier. basement membrane a sheet of amorphous extracellular material upon which the basal surfaces of epithelial cells rest; it is also associated with muscle cells, Schwann cells, fat cells, and capillaries, interposed between the cellular elements and the underlying connective tissue. It comprises two layers, the basal lamina and the reticular lamina, and is composed of Type IV collagen (which is unique to basement membranes), laminin, fibronectin, and heparan sulfate proteoglycans. basilar membrane the lower boundary of the scala media of the ear. Bowman's membrane a thin layer of basement membrane between the outer layer of stratified epithelium and the substantia propria of the cornea. Bruch's membrane the inner layer of the choroid, separating it from the pigmented layer of the retina. decidual m's (deciduous m's) decidua. Descemet's membrane the posterior lining membrane of the cornea; it is a thin hyaline membrane between the substantia propria and the endothelial layer of the cornea. diphtheritic membrane the peculiar false membrane characteristic of diphtheria, formed by coagulation necrosis. epiretinal membrane a pathologic membrane partially covering the surface of the retina, probably originating chiefly from the retinal pigment epithelial and glial cells; membranes peripheral to the macula are generally asymptomatic, while those involving the macula or adjacent to it may cause reduction in vision, visual distortion, and diplopia. extraembryonic m's those that protect the embryo or fetus and provide for its nutrition, respiration, and excretion; the yolk sac (umbilical vesicle), allantois, amnion, chorion, decidua, and placenta. Called also fetal membranes. false membrane a membranous exudate, such as the diphtheritic membrane; called also neomembrane. fenestrated membrane one of the perforated elastic sheets of the tunica intima and tunica media of arteries. hemodialyzer membrane the semipermeable membrane that filters the blood in a hemodialyzer, commonly made of cuprophane, cellulose acetate, polyacrylonitrile, polymethyl methacrylate, or polysulfone. high efficiency membrane a hemodialyzer membrane that has clearance characteristics that increase progressively with increases in dialysis blood flow rates; this usually implies that the membrane is not a high flux membrane. high flux membrane a hemodialyzer membrane that has a high permeability to fluids and solutes and thus a high rate of clearance of fluids and solutes composed of large molecules. 1. a membrane between the outer root sheath and inner fibrous layer of a hair follicle. 3. a homogeneous eosinophilic membrane lining alveolar ducts and alveoli, frequently found at autopsy of infants that were preterm. See also hyaline membrane disease. hyoglossal membrane a fibrous lamina connecting the undersurface of the tongue with the hyoid bone. impaired oral mucous membrane a nursing diagnosis approved by the North American Nursing Diagnosis Association, defined as disruptions of the lips and soft tissue of the oral cavity. Changes in the integrity and health of the oral mucous membrane can occur as a characteristic of such medical disorders as periodontal disease, uncontrolled diabetes mellitus, oral cancer, and infection with herpes. Chemical irritants such as alcohol and tobacco can also adversely affect the oral mucous membrane, as can mechanical trauma due to broken teeth, poorly fitting dentures, and endotracheal intubation. Other etiologic factors include dehydration, mouth breathing, poor oral hygiene, radiation to the head or neck, and antineoplastic agents. Preventive measures that can help maintain the health and integrity of the oral mucosa will depend on the cause. Routinely brushing and flossing the teeth during the day and at bedtime can help avoid dental caries and periodontal disease. Some patients may need instruction in the proper procedure for cleaning the teeth and removing debris and plaque, or they may need assistance in devising ways to cope with physical disabilities that make good oral hygiene difficult for them. Patients who are unconscious or unable to perform self-care activities should have mouth care as often as needed to keep the mouth clean and moist and avoid aspiration of debris and infectious microorganisms. Adequate hydration and a lip lubricant can help avoid alterations in the oral mucosa and promote comfort. limiting membrane one that constitutes the border of some tissue or structure. mucous membrane the membrane covered with epithelium that lines the tubular organs of the body. 1. either of the membranes, inner and outer, comprising the nuclear envelope. olfactory membrane the olfactory portion of the mucous membrane lining the nasal fossa. placental membrane the membrane that separates the fetal from the maternal blood in the placenta. plasma membrane the membrane that encloses a cell; it is composed of phospholipids, glycolipids, cholesterol, and proteins. The primary structure is a lipid bilayer. Phospholipid molecules have an electrically charged “head” that attracts water and a hydrocarbon “tail” that repels water; they line up side by side in two opposing layers with their heads on the inner or outer surface of the membrane and their tails in the core, from which water is excluded. The other lipids affect the structural properties of the membrane. Proteins embedded in the membrane transport specific molecules across the membrane, act as hormone receptors, or perform other functions. Reissner's membrane the thin anterior wall of the cochlear duct, separating it from the scala vestibuli. membrane of round window secondary tympanic membrane. Scarpa's membrane tympanic membrane, secondary. semipermeable membrane one permitting passage through it of some but not all substances. serous membrane the membrane lining the walls of the body cavities and enclosing the contained organs; it consists of mesothelium lying upon a connective tissue layer and it secretes a watery fluid. synovial membrane the inner of the two layers of the articular capsule of a synovial joint; composed of loose connective tissue and having a free smooth surface that lines the joint cavity. tympanic membrane see tympanic membrane. tympanic membrane, secondary the membrane enclosing the round window; called also Scarpa's membrane. unit membrane the trilaminar structure of all cellular membranes (such as the plasma membrane, nuclear membranes, mitochondrial membranes, endoplasmic reticulum, lysosomes) as they appear in electron micrographs. The biochemical structure is a lipid bilayer. vitelline membrane the external envelope of an ovum. 2. hyaline membrane (def. 1). 4. a delicate boundary layer investing the vitreous body. a thin layer of tissue that covers a surface, lines a cavity, or divides a space or organ. a thin tissue barrier through which gases are exchanged between the alveolar air and the blood in the pulmonary capillaries. complement components C5-C9 which form in terminal stage of either of the complement pathways and lead to cell lysis. the lower boundary of the scala media of the ear. a thin layer of basement membrane between the outer layer of stratified epithelium and the substantia propria of the cornea. the inner layer of the choroid, separating it from the pigmented layer of the retina. a mechanism in the cell membrane of epithelial cells in the intestinal mucosa which facilitates the rapid transport of for example glucose, into the cell and thus into the bloodstream. the middle of the three membranes on the outside of the yolk of the hen egg. the membrane connecting the thyroid cartilage to the cricoid cartilage. It is extensive in the horse and surgical incision through it allows access to the interior of the larynx. the posterior lining membrane of the cornea; it is a thin hyaline membrane between the substantia propria and the endothelial layer of the cornea. those that protect the embryo or fetus and provide for its nutrition, respiration and excretion; the yolk sac (umbilical vesicle), allantois, amnion, chorion, decidua and placenta. the outermost of the three membranes on the outside of the yolk of the hen egg. a membrane similar to the pseudomembrane; fibrinous exudates readily loosened from underlying tissue, as in croupous or pseudomembranous inflammation. one of the perforated elastic sheets of the tunica intima and tunica media of arteries. see fetal membranes. See also extraembryonic membranes (above). the strong, fibrous support layer in a joint capsule. 3. a homogeneous eosinophilic membrane lining alveolar ducts and alveoli, frequently found at necropsy in premature human infants. See also hyaline membrane disease. a fibrous lamina connecting the under-surface of the tongue with the hyoid bone. the membrane connecting the shaft of the fibula to the tibia. one that constitutes the border of some tissue or structure. the membrane covered with epithelium that lines many tubular organs of the body. the olfactory portion of the mucous membrane lining the nasal fossa. the innermost of the three layers on the outside of the yolk in the hen egg. the membrane that separates the fetal from the maternal blood in the placenta. the membrane that encloses a cell; it is composed of phospholipids, glycolipids, cholesterol and proteins. The primary structure is a lipid bilayer. Phospholipid molecules have an electrically charged 'head' that attracts water and a hydrocarbon 'tail' that repels water; they line up side by side in two opposing layers, with their heads on the inner or outer surface of the membrane and their tails in the core, from which water is excluded. The other lipids affect the structural properties of the membrane. Proteins embedded in the membrane transport specific molecules across the membrane, act as hormone receptors, or perform other functions. of a cell is the voltage difference across the cell membrane resulting from the differential concentrations of sodium and potassium on either side of the membrane. The resting potential, for example in a nerve cell, is altered by the temporary opening of the sodium channels in the membrane during an action potential, allowing a redistribution of the ions. the large number of proteins attached to a cell membrane. They include integral proteins, called also intrinsic, which are embedded in the phospholipid bi-layer of the cell membrane, and peripheral proteins, called also extrinsic, because they are loosely bound and can readily be extracted without damage to the cell membrane. a vascular membrane which occupies the pupil in the embryo stage, completely covering the anterior surface of the lens but subsequently disappears. See also persistent pupillary membrane. the thin anterior wall of the cochlear duct, separating it from the scala vestibuli. one permitting passage through it of some but not all substances. the membrane lining the walls of the body cavities and enclosing the contained organs; it consists of mesothelium lying upon a connective tissue layer and it secretes a watery fluid. the membrane on the outside of the soft contents of the hen egg and just inside the shell. It consists of two membranes close together, with an air cell in between. transport of electrolytes across semipermeable membranes with the aid of a transporter. the trilaminar structure of all cellular membranes (such as the plasma membrane, nuclear membranes, mitochondrial membranes, endoplasmic reticulum, lysosomes) as they appear in electron micrographs. The biochemical structure is a lipid bilayer. the membrane comprising the wing of the bat. the membrane investing the yolk of the hen egg; it includes (from the inside out) the perivitelline, the continuous and the extravitelline membranes.